Conor McGregor hits Floyd Mayweather Jr in a super welterweight boxing match. 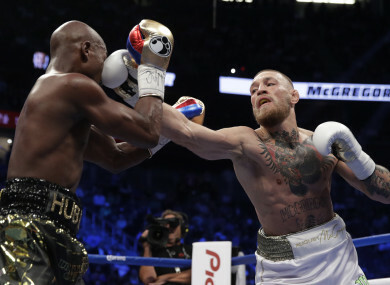 FLOYD MAYWEATHER AND Conor McGregor’s money-spinning superfight failed to break the record for gate receipts at a Las Vegas boxing bout, figures released by the Nevada State Athletic Commission revealed Wednesday. The controversial 26 August fight raked in $55,414,865.79, well short of the $72,198,500 generated by Mayweather’s 2015 “Fight of the Century” against Manny Pacquiao at the MGM Grand. The Mayweather-McGregor bout, staged at the T-Mobile Arena, sold 13,094 tickets, well short of the venue’s 20,500 capacity. The Mayweather-Pacquiao fight sold 16,219 tickets. A total of 137 complimentary tickets were given away for Mayweather-McGregor, won by Mayweather in a 10th-round technical knockout. Face-value ticket prices for Mayweather-McGregor were among the most expensive in history, with cheapest seats going for $500 and the most expensive for as much as $10,000. Although the fight failed to challenge the Mayweather-Pacquiao gate total, it becomes the second highest-grossing gate in Las Vegas history, surpassing the $20 million generated by Mayweather’s 2013 defeat of Canelo Alvarez. The bout is also set to be one of the richest fights in history if the most bullish predictions of pay-per-view television sales are met. Some predictions have suggested the fight could threaten the 4.6 million buys generated by Pacquiao-Mayweather. Official numbers have not been released although executives from cable network Showtime Sports said they expected the bout would at least be second. Email “Mayweather-McGregor gate receipts short of record”. Feedback on “Mayweather-McGregor gate receipts short of record”.